[THE FACT] The group IMFACT received a Rising Star Awrads from ‘FAN N STAR’. They got the honor of ranking first for five consecutive weeks in ‘FAN N STAR’, a k-pop voting site where the Korean, Chinese, Japanese, and English speaking fandom gathers. On the 29th, ‘FAN N STAR’ has delivered the trophy to the group INFACT and disclosed the video of delivery. Previously, IMFACT has ranked 1st for five consecutive weeks for the rising star votes from November 5 to December 19 last year. With this, a trophy was delivered to IMFACT. 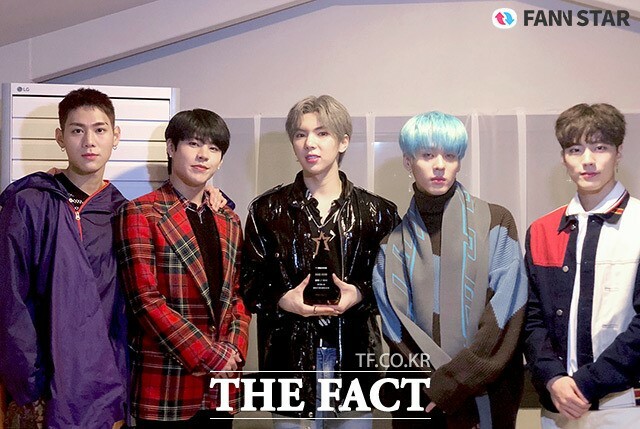 IMFACT has shouting their joy when they received the trophy from ‘FAN N STAR’. “We recorded top 1 for 5 consecutive weeks in the Rising Star awards of ‘FAN N STAR”, said Jian. The members showed their happiness by shouting out their joy while holding to the trophy. Lee Sang thanks in the video, “Lea Sang knows that this is from our fans, from IF, so thank you so much”, he said. Taeho also showed his aspiration as by saying “Lee Sang says that this is an award for the potential stars who will be trending. We will become trending guys”. Jeup also said the new year with hope saying, “Receiving a nice award as the new year starts, I think we can have good start of this year”. Ungjae said, “As you have showed your love, we will pay it back with our ‘Only U’ activity so please support us and set your expectation on it.” And Jian also added, “Please love our new song Only U a lot”. Candidate will be selected randomly by ‘FANNSTAR’ and will be focused on the artists who have the potential to emerge as a future trend. Regardless of the debut year, gender, or age, any artists who grow distinctive musical activities can be a candidate. Special Benefits are awarded if the artists are ranked first for five consecutive weeks in Rising Star Award. First, the winners will be announced through the website of ‘THE FACT’ in Korea, Japan, and China. The news about winning Rising Star Award can be seen beyond Korea. By disclosing their awards abroad, they can get the chance to expose themselves to become a global k-pop artist. The trophy video of IMFACT will be displayed in waiting areas of 43 subway stations, Line 2 in Seoul from January 29 ~ February 4. Also, they will be nominated as a candidate of ‘Rising Star Awards’ of ‘THE FACT MUSIC AWARDS’ which will be held on April 24, 2019.